When corrosion starts, it shortens the life of the heat exchanger by reducing durability and allowing bacteria to grow. 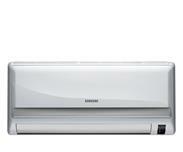 Samsung heat exchanger fin is designed to resist corrosion so you have cool, comfortable air for a ling time. Talk about a breath of fresh air. Samsung's Virus Doctor system dramatically improves indoor air quality so your every breath is a pure, healthy one. It eliminates invisible, health-threatening biological contaminants such as viruses, bacteria and allergy-causing agents, protecting you from disease and everyday illnesses. Purifying over 19.16m³ of space, the Virus Doctor system not only blows a lot of fresh air into a home, it blows away the competition.